There is no known commemoration for this soldier. His inclusion in the web site because his parents at the time of the 1st WW were living in the cemetery lodge. Research into his life is on going. Sec. Lieut. A.C.H. Gibbs was a member of the Australian Imperial Force (A.I.F.) He was the only son of Mr. and Mrs. Gibbs, of the Cemetery Lodge, London Rd. Reading. The Standard of 24th November 1917 – carried the notification that he was a Prisoner of War having been previously reported as missing. He had been a former clerk in the Reading County Court. Lieutenant Gibbs had emigrated to Australia, from Reading, where he held the position of Clerk to Shire Council at Roma, Queensland. He had enlisted in 1915 and obtained his commission in Australia. 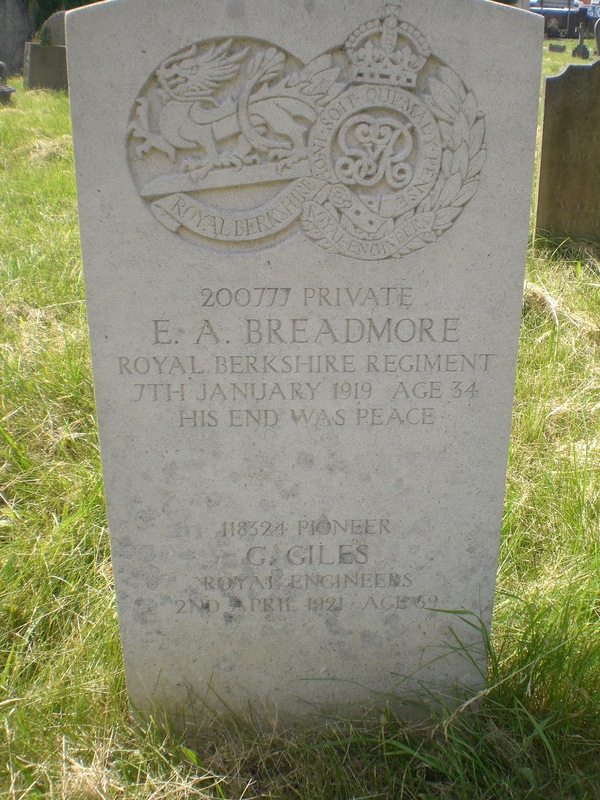 Ernest Albert Breadmore, known as Tom was the husband of the Louise Annie Jones (formerly Breadmore), of 21, Dover Street, Reading. He died on 7th January 1919 aged 34 years of phthisis – pulmonary tuberculosis. Never forgotten by his sorrowing Wife and children. The 1911 census indicates that Ernest Breadmore was a carter delivering parcels. His war record indicates that he attested for service on 15th September 1914 . 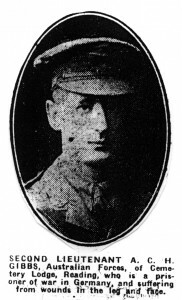 He left for France with the battalion on 30th March 1915. After a series of illnesses including bronchitis and trench fever during late 1916 and early 1917 he was discharged as not physically fit in March 1917 and returned to England. It was suggested that he might undertake light duties and home service but unfortunately his illness prevented him from working. George Giles, died on 2nd April 1921, aged 59 years. The circumstances of his death are not known. The two men share a grave and it is assumed that there is a family connection. The grave stands next to a Giles family grave. Both families lived in Brunswick Place, Reading. The grave number is 7.4353 and is marked with a CWGC war pattern headstone bearing two badges. Frederick William Gill, was the son of Arthur Frederick and Catherine Gill, of 72, Walbeck Street, Reading. 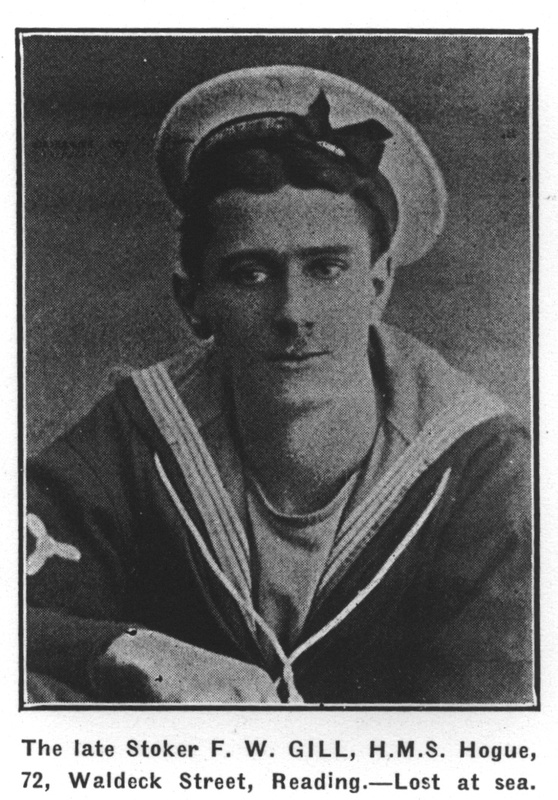 He died on 22nd September 1914, aged 24. He is commemorated on the Portsmouth Naval Memorial, Hampshire. Reference 4. The “Hogue2 was sunk by enemy submarine together with the “Aboukir” and “Cressy”.